Crampton faced a tough Antron Brown in his first round. Brown was first off the starting line, but had to pedal his dragster around 200 feet. Crampton went straight down the groove, and he got the first round win, running just off his qualifying time. Next in round two, Crampton faced Leah Pritchett, who he’s only beaten once in their five times racing. Stepping on the pedal with an unbelievable .022 reaction time, Crampton made the record 4-2, turning on the win light with a close hole-shot win. Margin of victory was 0.0126 seconds, equaling approximately 6 feet at the finish line. Crampton’s semi-final opponent TJ Zizzo came in to the round with lane choice. 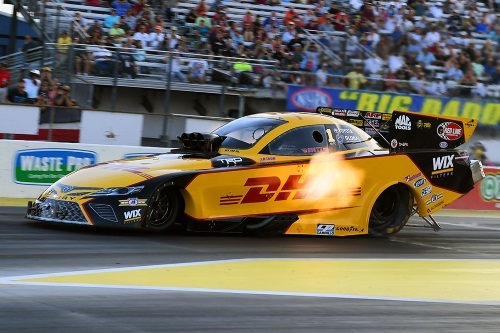 Zizzo left the starting line before Crampton, but the DHL dragster made up the difference within 200 feet and sailed on to get the win and move onto the finals. Going for the win, Crampton had to defeat Clay Millican, who also had a winning record against him (4-1). Crampton again had a better reaction time than Millican giving him the event win in a very close final round race. The margin of victory against Millican was 0.0032 seconds (approximately 18 inches). Crampton wins his second consecutive Gatornationals Wally and the ninth in his career. Comments on winning 25 years after the famous father/son final between Scott and Connie Kalitta: It’s definitely on my mind a lot . We had Colin Kalitta hanging out with us this weekend, Scott’s son. Leading into this race, I watched the videos of that particular final round, where Connie raced Scott in the final here. That history of Kalitta and this race track is pretty impressive and it’s nostalgic to watch Connie win here. And to have him put me in the winner’s circle today, kind of has a full circle feel to it. This win makes Crampton the only active Top Fuel driver to earn back to back wins in Gainesville; seventh driver in history. Doug Kalitta has won this race three times, the most recent in 2014. 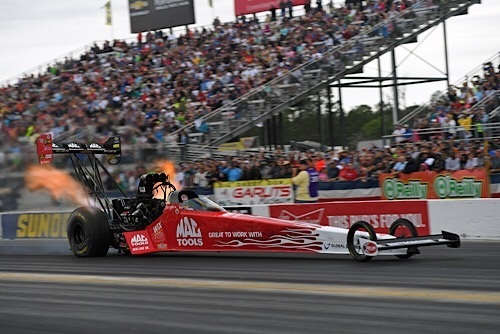 First round Kalitta matched up with Terry McMillen, who was runner-up here in 2016. Kalitta was 14 – 2 against McMillen in prior events. 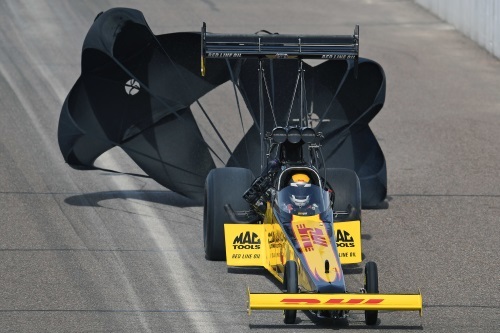 Kalitta had the starting line advantage and that was enough to give him the first round win. The second round paired Kalitta with 2018 Top Fuel Champion Steve Torrence. Kalitta got off the line first and never trailed for the win, moving him to the semis where he faced Clay Millican. Even though a reaction time advantage started the race in Kalitta’s favor, Kalitta’s Mac Tools Dragster went up in smoke and Millican gets the win. 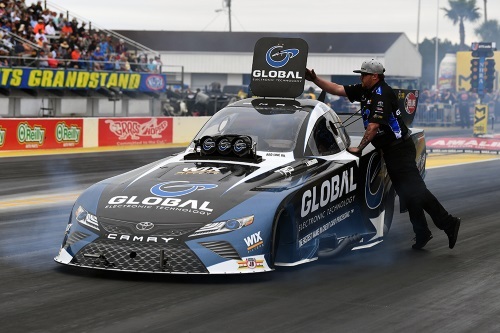 It seemed Pedregon may have had Langdon’s number during this first round match up as the Global Electronic Toyota Camry was 3 – 1 against Pedregon in prior events. Langdon got the advantage off the line, stayed in front through the sixty foot mark, then Pedregon was able to power by and pulled away for the win. Todd went into this first round 5 – 3 against Beckman in prior events. JR was first off the line, got about 200 feet out and had to pedal as the DHL Camry goes into tire smoke. Beckman drives around him at that point and goes right down the groove for the win. 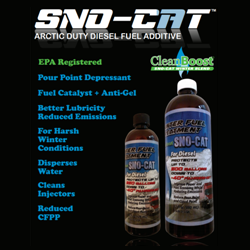 Based in Ypsilanti, Mich., Kalitta Motorsports is a Top Fuel and Funny Car drag racing team in the NHRA (National Hot Rod Association) Mello Yello Drag Racing Series. 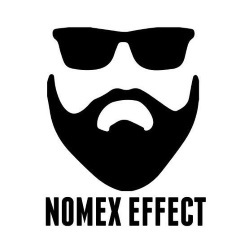 The team was founded and is owned by drag racing icon Connie “the Bounty Hunter” Kalitta. For more than 50 years, Connie has been involved in the sport as a driver, tuner, and an owner. Kalitta Motorsports is one of the most successful teams in the history of auto racing with seven world championships and over 100 national event titles in five different professional drag racing sanctioning bodies since it was established by Connie in 1959. 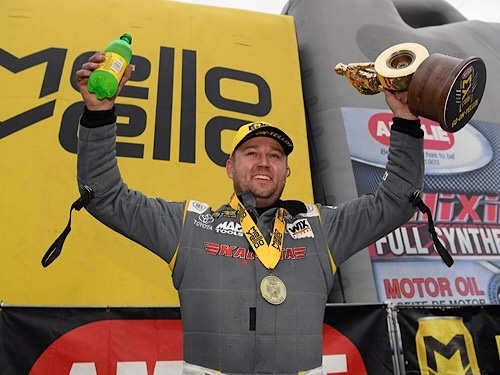 Team Kalitta fields four full-time entries in the NHRA Mello Yello nitro classes. Connie Kalitta’s nephew, Doug Kalitta, pilots the Mac Tools Top Fuel dragster while former Rookie of the Year winner Richie Crampton drives the DHL Top Fuel dragster. In Funny Car, J.R. Todd is the driver of the DHL Toyota Camry Funny Car and Shawn Langdon pilots the Global Electronic Technology Toyota Camry Funny Car. 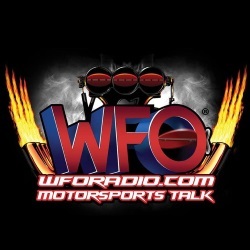 Connie Kalitta serves as head tuner for all Team Kalitta entries. He is assisted by co-crew chiefs Jon Oberhofer and Todd Smith on the DHL Toyota Camry Funny Car, Nicky Boninfante and Del Worsham on the Global Electronic Technology Toyota Camry Funny Car, Kurt Elliott on the DHL Top Fuel dragster and Rob Flynn and Troy Fasching lead the efforts on the Mac Tools Top Fuel dragster. Associate sponsors on Kalitta Motorsports’ race cars include AutoDesk CAM, Champion, Cogistics, Darton Sleeves, DHL, Global Electronic Technology, JEGS, Justice Brothers, Kalitta Air, Mac Tools, Racing Electronics, Red Line Oil, SealMaster, Toyota, and WIX Filters.